Will Scholes insists the ‘positive atmosphere’ and upturn in results at Bury St Edmunds stems from the arrival of head coach Nick Wakley. It’s nearly two months since the former Wales Women’s Sevens coach joined the Suffolk club after Jon Curry’s shock departure. Since then, Bury have turned their fortunes around and the Wolfpack currently find themselves in the top six of National Two South following an encouraging run of form. Over the course of their last eight games, Bury have picked up 24 points – which is more than the club accumulated from their first 11 matches of the campaign. Wins against Birmingham and Solihull, London Irish Wild Geese, Old Albanian and Guernsey have lifted spirits at the GK IPA Haberden and Scholes, who has been an ever present for Bury this term, is enjoying the current vibe surrounding the club. Loving the new challenge with @BSERugby nice birthday present with a great session tonight! “I think it [the season] has been a bit mixed,” Scholes told ncarugby.com. “We started off with a defeat to Henley [Hawks]. We then beat Old Albanian away which was a good step up for us, but we then lost a few on the bounce and we sort of collapsed a little bit. “The atmosphere at the club was a bit negative. I think there was quite a few external factors which did sadly lead to Jon’s departure, but Nick has come in and has changed a few things. “The atmosphere has improved and the whole vibe is really good. I feel like we are learning quite a lot week in, week out at training so it is quite a pleasant environment to be in. When Wakley made the decision to join Bury, the Wolfpack found themselves hovering above the relegation zone after securing just one victory since the end of September. The club revealed the decision to part ways with Curry was down to a ‘funding shortfall’ for their 1st XV and the unfortunate run of results Bury were experiencing provided little comfort for one of their most senior coaches. Bury acted quickly to appoint Wakley and Scholes admits the experience the ex-Wales Women’s backs and attack coach brings to the club has benefitted everyone. Scholes said: “He [Wakley] came in and he didn’t really want to change too much. For a example with the line-out calls, we just went back to basics and we’ve worked from there. “He really wants us to kind of study the game whenever we can get some video sessions in. We always try and learn from our opponents and also, we learn from what we have done the week before. I would say it is a lot more process-based and he is definitely confident in the processes he’s probably used in the past. Bury have lost on three occasions since Wakley’s arrival, two of which have come against promotion challengers Canterbury and Rams RFC. The Wolfpack’s most recent result was a 19-3 defeat against the Rams, who are currently 16 points clear at the top of National Two South. 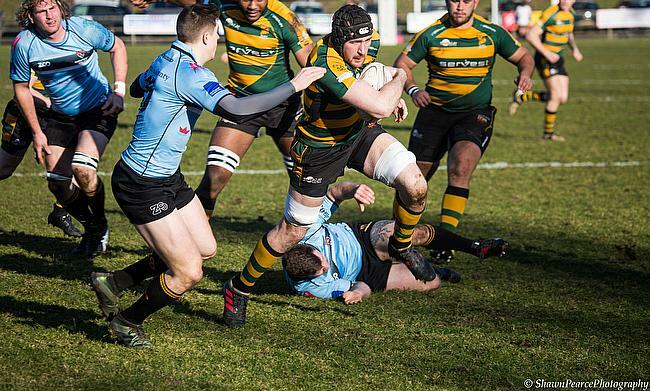 Next up for Bury is a third away fixture in January when they travel to fifth placed Tonbridge Juddians this weekend and Scholes, who has scored six tries this term, is hoping his side can be more ruthless after not converting their chances against the league leaders in Round 19. The second-row added: “We have done some good things throughout the season, but it has just not been for a full 80 minutes which is why we have lost some games. “Against Rams, we were a bit unlucky. They are good side, but we had most of the possession, but didn’t manage to finish off the opportunities we created while they were clinical. We played well and I think since Nick has come in, he has kind of reinforced that if we can keep our work rate up throughout a game, we are up there with the best teams. TJs may well be just one place above Bury heading into this weekend, but there is a 19-point gap between the two teams. Bury have never finished higher than sixth place in National Two South- which they achieved in their maiden season at this level in 2015/16 – and Scholes reiterated the club are only concentrating on improving instead of fixating on what position they may end the season in.